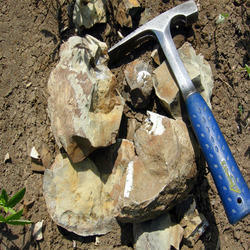 Rock Picks or Geology Hammers have bonded and molded Shock Reduction Grip. Nylon end cap now makes this hammer the most durable on the market. The head and handle are forged in one piece and are fully polished. These tools have unsurpassed balance and is double tempered for added strength. excellence! 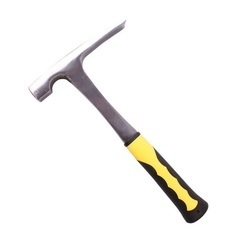 Extremely robust and almost indestructible, medium-weight pick hammer, well-tried particularly with crystalline rock. The pointed tip rock pick is forged from one piece of steel and equipped with a shock-reduction vinyl grip. Estwing's Chisel Edge Rock Picks or Geology Hammers have bonded and molded Shock Reduction Grip®. Patented nylon end cap now makes this hammer the most durable on the market. The head and handle are forged in one piece and are fully polished. These tools have unsurpassed balance and is double tempered for added strength. Net wt. : 30 oz. Head Length : 7½ in. Height 11 in. Medium-Heavy weight chisel point hammer. Great for harder rocks and collectors that want to do the most work. Wholesaler of Geological hammer and steel and iron both are available.